Sportswear is often unisex. There is performance sportswear and more casual clothing for sports which is reflected in the price. 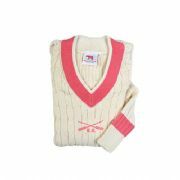 The only item that is exclusively for members is the cricket jumper with a Leander pink border where we offer and alternative for non members. All the other items can be bought by members or the public. Please contact the shop if you need further details on sizes.